The statue representing Iowa in the terrace of 14 states comprising part of the original Louisiana Purchase at the World's Fair St. Louis in 1904. A “place of enchantment” that promised to “bewilder attendees with its surpassing beauty” and “compel the admiration of all who see it.” Those flattering words described the Louisiana Purchase Exposition of 1904 or as most people called it — the St. Louis World’s Fair. There were over 1500 buildings comprising the fairgrounds on over 1200 acres of “newly redesigned” Forest Park. Building of the fairgrounds required back-breaking work from over 10,000 laborers. The seven-month long event promised to delight guests with displays of the latest in technology, fine art, manufacturing, science, and education. Exhibits from 50 foreign countries and 43 of the 45 states packed the buildings and grounds. When the president of the fair invited, “Open ye gates; swing wide, ye portals!” on opening day in May — about 200,000 guests took advantage of the invitation and streamed through the gates. 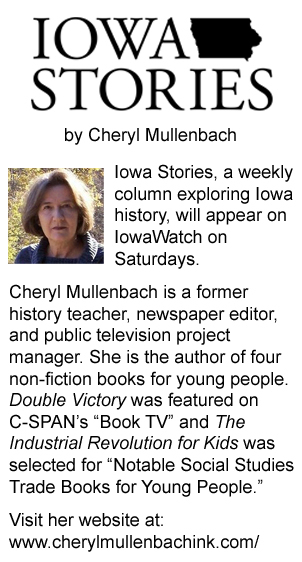 And many of those who passed through over the months learned about the great state of Iowa! The Hawkeye state was well represented with displays and exhibits that showcased its agricultural, manufacturing, and educational resources. 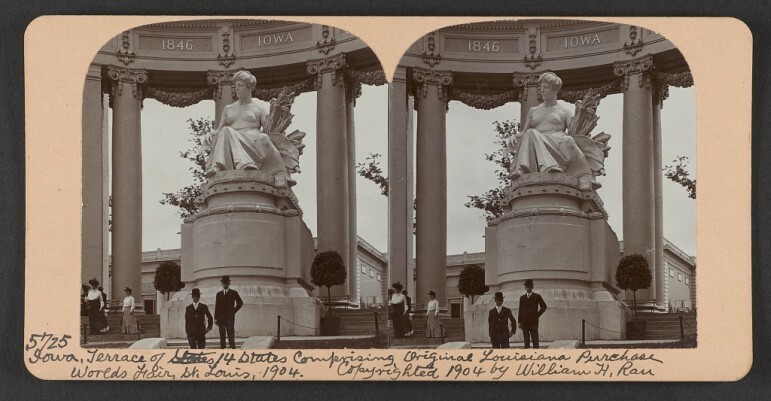 The Iowa Building — “a credit to Iowa in every sense” — was situated at the intersection of two “prominent thoroughfares” and overlooked a plaza lush with flowers and tropical plants. The grounds were shaded with lovely trees, and the French Renaissance style ivory building measured 68 feet wide by 106 feet long — including ample porches and second floor balconies. As visitors entered the Iowa Building they were greeted by a 22 by 28-foot rotunda with two large public parlors leading off the center. There were two reading rooms, a women’s retiring room, secretary’s office, a post office and toilet rooms. The building was built to accommodate Iowans who visited the fair and any others who sought a resting place during the long fair days. At the Palace of Agriculture Iowa’s exhibit featured a display showing the various ways corn would be utilized commercially. Products made from corn which “the average person” would never think “had their origin” in the crop were on display—rubber, sugar, gum, oil, writing paper, and syrup. Nine manufacturing firms from the state had farm machinery in the building. The dairy section included butter figures sculpted by Iowans. The state’s apiarists demonstrated the fine honey produced in the state. The Palace of Horticulture included 700 plates of choice apples from the 18 varieties of the fruit grown in Iowa. Iowa was one of the few states that submitted displays at the Palace of Manufactures. Thirty factories representing every part of the state showcased brick, building blocks, pottery and stoneware. The Palace of Mines and Metallurgy’s façade was made with stone from Stone City, Iowa. Exhibits of Iowa coal, shale, gypsum, and clay were located there too. The Palace of Education housed exhibits from Iowa educational institutions, including kindergarten through universities. Eighty cadets from Iowa State University marched under the command of James R. Lincoln, an ex-Confederate soldier. The Building of Anthropology featured large oil portraits of Iowa pioneers on loan from the State Historical Association. June 17 was designated “Iowa Day” at the fair by fair planners. Railroad companies from “all points” in the state offered special excursion rates for Iowans who wanted to travel to St. Louis. Over the course of the fair close to 20 million people passed through the gates. Among the visitors were some celebrities including Theodore Roosevelt, Helen Keller, and Mark Twain. Iowa’s former governor, William Larrabee, attended as did the current governor, Albert B. Cummins.